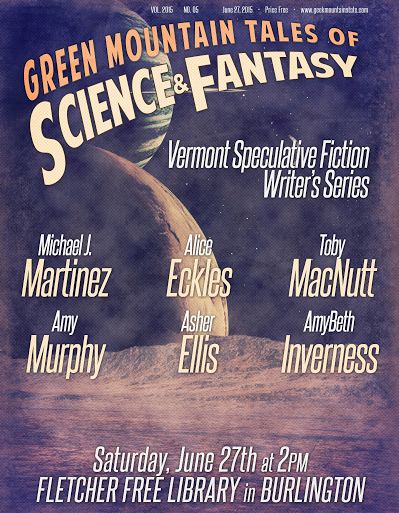 I do not, in fact, live in Vermont, but I have roots there — enough for Andrew Liptak, proprietor of Geek Mountain State and the Vermont SF Writer’s Series, to invite me to the latest Vermont SF Writer’s Series event on Saturday, June 27 at 2 p.m. in Burlington. He even did up an extremely cool poster! Seriously…that’s pretty awesome. And it’s a pretty nifty slate of writers. I’m really excited to be a part of this. I’m not sure what I’ll read yet — perhaps something from The Venusian Gambit, or maybe one of the short stories I have coming out later this year. So if you’re near Burlington, VT on June 27, stop on by the Fletcher Free Library. We’ll read some stuff, talk writing, hang out. It’ll be great.